The one with Zoya Surf collection Rory! Happy Hump Day! One step closer to the weekend! Dang I'm hungry. As soon as I get this post done, I'm gonna havta eat something! Okay, just a bunch of random sentences hahaha Today's post features Zoya Rory, a light, brightish purpley pink metallic from the new Beach collection! This polish had an awesome formula, and I only needed one coat! 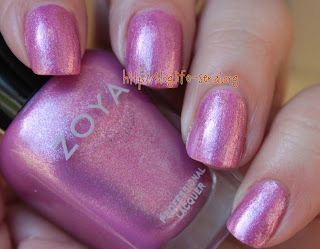 On Zoya.com, Rory is described as "Medium mauve pink with lilac tones, gold and silver reflective metallic shimmer accents, and a foil-like finish. The gentle color of this polish gives the foil finish a softened appearance." Like I said, ONE COAT. Who doesn't love a good one coater? I can't say enough how much I loved this polish :) It's not too pink (tho I still had crazy shimmer after removal), and the formula was just right. She's very shiny :) hehe At times she tends to lean pink, but then all I would have to do was shift my hand and she'd lean purple. This polish is more of a dusty pink, I think, in terms of pinks. Did I mention my 1111 follower giveaway is up? Have you entered? There's less than two days left!